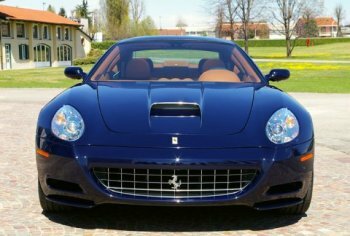 At the Villa d'Este Concours d'Elegance on Friday Pininfarina will unveil a specially coachbuilt Ferrari 612 Scaglietti commissioned by American Ferrari collector Peter S. Kalikow. This will the the second coachbuilt Ferrari to be shown at the prestigious Italian Concours d'Elegance this year as another famous design house Zagato will also be presenting their new Ferrari 575GTZ, built especially for legendary Japanese Ferrari collector Yoshi Hayashi. This emerging pattern follows an exciting new trend that is seeing the world's most famous coachbuilding brand names turning their skilled attentions to creating evocative one-off Ferrari models, harking back to a golden age when the rich and famous, such as film director Roberto Rossellini and actress Ingrid Bergman, were regularly seen at the wheel of unique sportscars bearing the Prancing Horse badge. This new policy comes as a result of enthusiasm for a revival of the tradition by Ferrari President Luca di Montezemolo who has now relaxed rules that mean that any 'specials' built in recent years had to have their Ferrari badges removed, at a stroke wiping out their desirability and collectable value. However Ferrari are keeping a very close eye on these projects, giving the green light on an individual basis and demanding that no alternations are made to the mechanicals. As well as this new 612 Scaglietti by Pininfarina and the 575 GTZ from Zagato, both which will be unveiled later this week, last year another legendary Italian automotive designer Giorgetto Giugiaro created a special fully-working showcar based on the 612 Scaglietti chassis to celebrate his 50 years at the forefront of the international design business. The most striking detailing change at the front of the car is an rising air scoop that is sharply ridged right up the centre of the bonnet very much in the manner of the recent Pininfarina designed 575 M Maranello, and a feature that is carried onto the new 599 GTB Fiorano. At the side of the car the 612 Scaglietti's distinctive long 'scallop' finishes behind the front wheels with a large new air outlet. 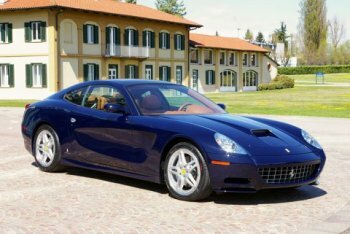 At the Villa d'Este Concours d'Elegance on Friday Pininfarina will unveil a specially coachbuilt Ferrari 612 Scaglietti commissioned by American Ferrari collector Peter S. Kalikow. Called the Ferrari GG50 in tribute to this notable anniversary he first presented it at the Tokyo International Motor Show last autumn, and then to a wider European audience at the Geneva Salon last month. Also impending in the pipeline from Pininfarina is an exciting new project, commissioned by a US film director and based around the awesome Ferrari Enzo V12 supercar, which will see the light of day later this year. This new 612 Scaglietti interpretation has been created by a special division within Pininfarina that focuses on such projects, most recently realising the secretly-commissioned Ferrari 'station wagon' project. This new model, which will be presented at Villa d'Este on Friday, retains the car's existing 540bhp V12 engine and transmission at Ferrari's request, but features a host of detailed styling and interior changes that clearly evoke Pininfarina's long and successful traditions with the Ferrari brand. It has been commissioned especially by Peter S. Kalikow, who is the President of New York's Metropolitan Transportation Authority and a renown Ferrari collector, owning such cars as a 250 GT Pininfarina, 330 America and 400 Superamerica Pininfarina, as well as modern-day examples such as the 575 M-based Superamerica. He reportedly wanted Pininfarina to create a car that would be only very subtly different to the 'standard' 612 Scaglietti model, with changes that would not be easily recognisable except to more dedicated enthusiasts of the Maranello brand. 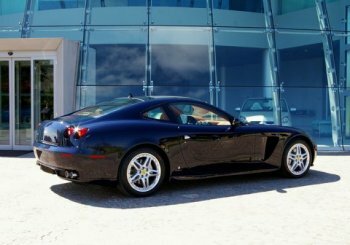 The most striking detailing change at the front of the car is a rising air scoop that is sharply ridged right up the centre of the bonnet very much in the manner of the recent Pininfarina designed 550 and 575 M Maranello range of front V12-engined sportscars. The front grille also receives a distinctive chrome edging treatment. At the side of the car the 612 Scaglietti's very distinctive long 'scallop' treatment now finishes behind the front wheels leading into a large new air outlet. This has been carefully designed to blend into the whole flowing 'scallop', rendering this styling feature now to be a purposeful addition to the sportscar's airflow requirements. Inside the car a number of smaller detailing changes have been made to 'personalise' the car to the new owners tastes.